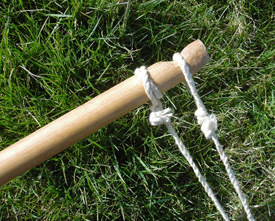 The end of the staff, showing the open loop on the free end of the string, the fixed end of the string set in the groove just below the hook, and the profile of the hook carved into the staff's end. 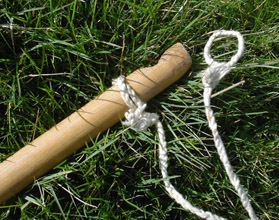 The end of the staff, showing the loop of the free end hooked onto the hook, and the strings pulled taut as they would be during the start of the slinging action. Below you see a box with some highlit words in blue. 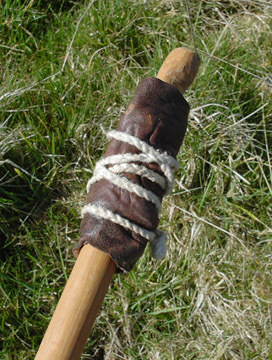 By clicking on these you can download a rather large MPG movie file, which, all going well, will show you moving pictures of me on Newcastle Town Moor using my staff sling. I was on my own when taking this footage, and only had one sling stone left when I came to make this recording. This is my excuse for the fact that the head of the staff goes out of shot at the top of frame. 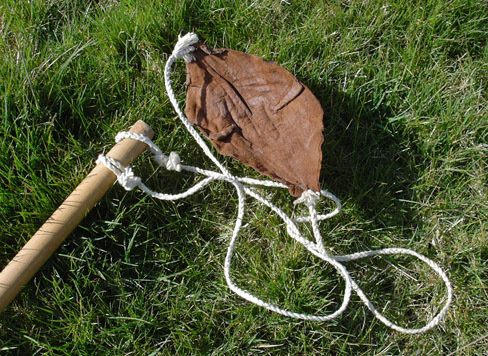 I hope one day to get a better take of the staff sling in action. Nevertheless, you can see from the file that the technique is very easy and smooth. I should admit that the stone from the cast you see didn't go very far, because it went directly forwards, and not high into the air.